With tears streaming, I am so grateful to share with that our dear Noah is no longer relying on his gastric tube (g-tube) to sustain himself. What an absolute life changing, miraculous summer he has experienced. Noah himself can sing the lyrics to the song above. Each word is our family testimony of what was often a very dark journey. But God is faithful and was present every step. We are so aware rarely does a special needs child walk away from their challenges. We are so incredibly grateful, humbled and in awe of the healing Noah has experienced. On June 30 Noah was admitted to the Peter Lougheed Hospital in Calgary. That morning was the last time we tube fed Noah. He was not given anything, including fluids, in his g-tube from that point forward. It was a test of our reliance on God's comfort to see our son struggle to chew, shallow and struggle to understand hunger and respond appropriately. We never doubted our choice but were on our knees praying that this would be Noah's chance to become an eater. We had the support and care of a wonderful Dr. This man, Dr. Stephen Wainer, was the first medical professional to endorse our desire to try a tube wean with Noah. He saw that despite a tough start in life, Noah clearly had the ability to do a wean. We set aside the disapproval of many other Drs. and para-professionals and tried it. With joy, we have said good bye to using his g-tube for feeding, medications, fluids. With amazement, our son no longer retches. At all. Ever. He doesn't cough. He sleeps all night long and enjoys a nap daily. He is so so happy and cheerful. He has maintained his weight for several weeks. He is learning the art of chewing, flavours, smells and the social elements of eating with others. He still has to gain weight. It will come. He still has to face surgery to remove the tube and deal with the infected granulation tissue on his stoma site (tentatively scheduled for November 6). But there is no looking back. Noah is an oral eater. It is still a bit hard to believe. Never once did we ever walk alone. Thank you God for this gracious gift of renewed health for Noah. Thank you to all our supporters who helped us. To our friends and family who checked in, some of you daily, to cheer us on, to listen to us cry, to encourage us when we felt lost. I have stacks of cards from friends who wrote prayers, notes of hope and encouragement. Thanks to those who asked questions and tried to understand tube feeding better. Thank you for praying. Thank you to Noah's little buddies for including him in things even when he wasn't sure how to participate in eating and now for licking many ice cream cones with him! 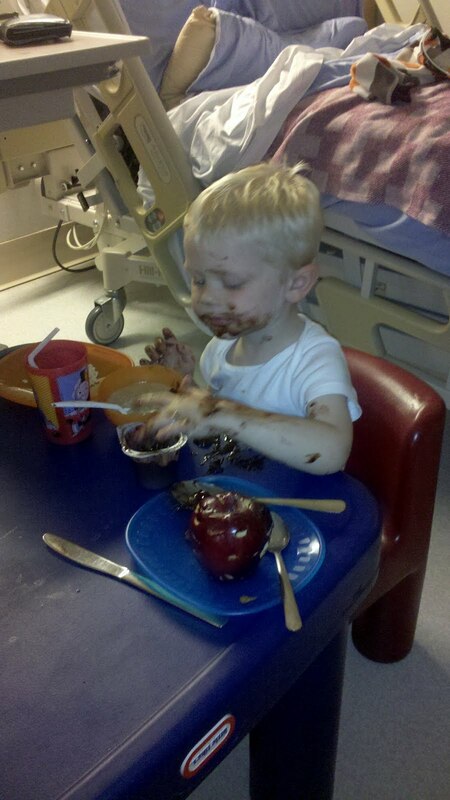 One of Noah's first "meals" at the Peter Lougheed Hospital - chocolate pudding was a favourite early on! 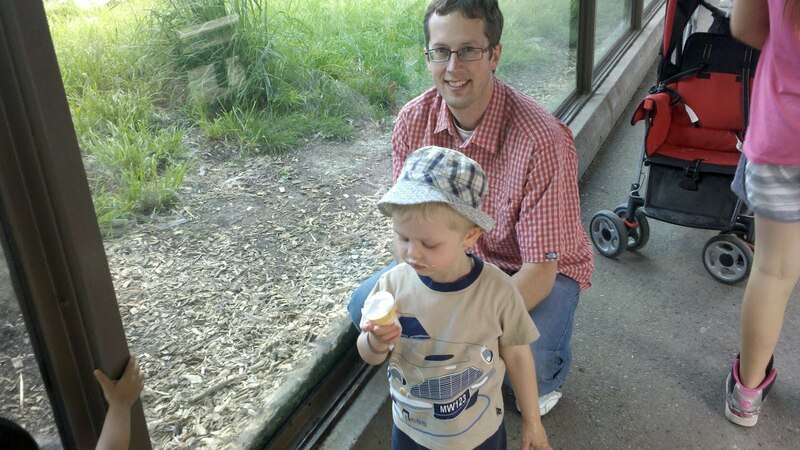 Eating an ice cream from Grandma while we enjoyed a few hours at the Calgary Zoo. There is a huge joy in watching a little boy lick and lick at an ice cream! Playing in the "kitchen" for the first time and pretending to cook. If you are currently tube feeding your child and you need any support, encouragement, tips on blenderized feeding, more details about our experiences along the way and the tube weaning process, please leave a comment below with your contact details and I"ll get in touch. What an amazing summer you have had! GOd has truly been faithful! what and inspiration!